Wkly Brief – Junk Drawer or Treasure Chest? It started as a place to keep paperclips, and maybe to squirrel away a pen. Soon there are fat, purple rubber bands, the kind that hold the broccoli together at the grocery story; rubber bands that you have to keep because you just might need them someday. There’s the eraser that fell out of the end of the pencil, and the pencil that’s just a nub. And the twist ties: long ones, short ones, yellow plastic ones with serrated edges that stick through a hole. Maybe if your lucky you’ll find a real pair of scissors; not the little kid scissors that were glued shut and pried open. And there’s the screw that fell out of something, somewhere; you know you’ll discover where it goes as soon as you throw that darned screw out. Tonight, I have so much to share, that I feel like I’m going to hit you with an overstuffed junk drawer. But if you have a junk drawer, you know it is the place to go when you need that special something. Then, as you dig through its contents it becomes your a treasure chest, filled with the silver and gold you need at the moment. I hope that you will take a few moments to dig through my treasure trove. Perhaps you will find something particularly valuable. To help you out, I’m sectioning this post into the topics below. If you’re a shopper looking for holiday gifts, love to read, or want to help friends with their literary aspirations, there is something in my junk drawer for you. My one year blogging anniversary is this week. I remember the day, because it was immediately following my attendance at the Massachusetts Conference for Women. So tonight, on the eve of the same conference one year later, I am celebrating. That conference provided me with timely encouragement. Tomorrow, I will be Tweeting from the conference and hope to find new inspiration from the many speakers and workshops. Author J.E. Seymour at the Barrington Library. Are you done with your holiday shopping? If not, you can pick up autographed books from NH Writers. Click here for Upcoming Events. I just purchased J.E. Seymour’s Stress Fractures as a gift (for me). If you can’t attend an event, but want support NH Writers, here is a list of writers who will come speak at your local library or book club. If you aren’t from NH, consider finding out more about your State’s authors. If you can’t find any authors in your State, you are welcome to claim NH as your home and buy books from our authors. Do you already have a favorite NH Writer? Consider nominating your author for the NH Literary Hall of Fame. Southern New Hampshire University has allocated space in their new library to promote NH Authors. Perhaps your favorite author will be selected in the inaugural year and you will have been a part of that. Twitter Authors – I’ll be releasing my next list of Twitter Authors by December 15th, and in honor of NH Writers’ Week, I will be focusing on published NH Authors. To get on my growing list of Twitter Authors, follow me @brathhoover. Most likely I’ll be sharing many inspirational thoughts from the conference tomorrow in upcoming posts. Finally, NaNoWriMo might be over, but with 70,000 words written and just 10 scenes left to go, I’m pulling together my beta readers, editor, and digging into my second draft. Goal: Draft two done by January 15th. I’ll keep you ‘posted’. 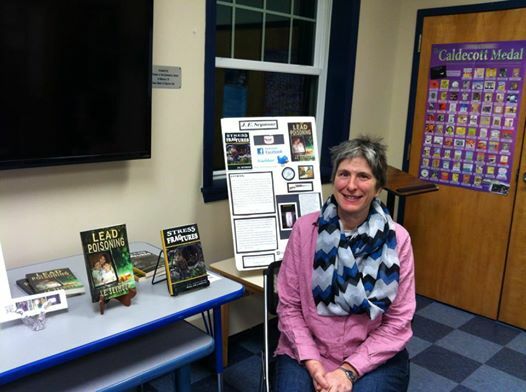 This entry was posted in FYI for Regular Visitors, Reading and Writing and tagged Conference for Women, JE Seymour, NaNoWriMo, NH LIterary Hall of Fame, NH Writers' Week. Bookmark the permalink. 1 Response to Wkly Brief – Junk Drawer or Treasure Chest? Yay! My husband Jim would be delighted to see your shout-out to the Literary Hall of Fame. He’s on the Board of the NH Writers’ Project, and it was actually his brainstorm to create a Hall of Fame for NH writers. Nice publicity!